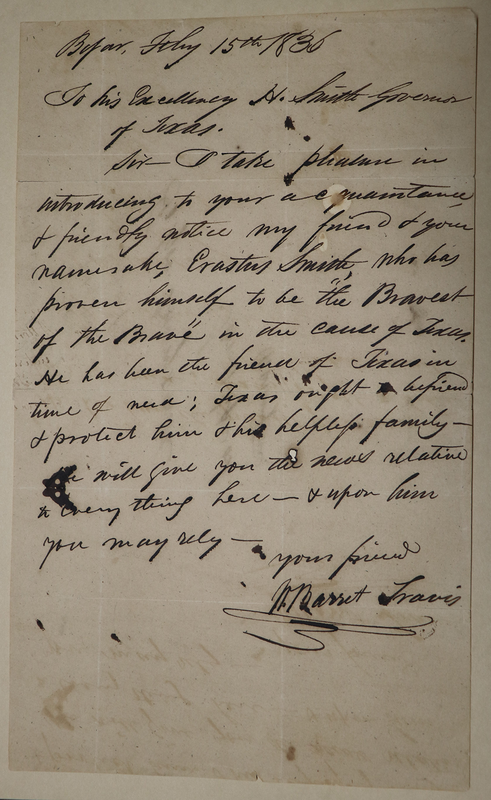 Among the documents in the Alamo Collection is this letter written by William Barret Travis to Governor Henry Smith. Letters of introduction were very important in the early 19th century. They vouched for the character of the person being introduced, much like letters of recommendation for employment today. In this letter Travis introduces “Deaf” Erastus Smith to Governor Smith. Travis praised Erastus, calling him “the Bravest of the Brave.” He called Erastus Smith “the friend of Texas in time of need”, indicating his importance to the Texian cause. This letter shows how highly William B. Travis thought of the man that would prove to be one of Texas’ most valuable scouts and soldiers. Travis’ was correct in stating, “Texas ought to befriend & protect him”, because it was Erastus Smith who was ordered to destroy Vince’s bridge at San Jacinto, thereby trapping the Mexican Army against Peggy’s Lake and preventing their escape.